You can definitely make this in a quick pinch for any barbecue or get-together this summer, but if you let it marinate for a couple of hours, the flavors will develop even more. I made ours with black olives because my hubby and son love them, but if it were just for me, I’d leave them out! I’m kinda anti-olives. If you prefer a different kind of olive, you can definitely use those instead, too. 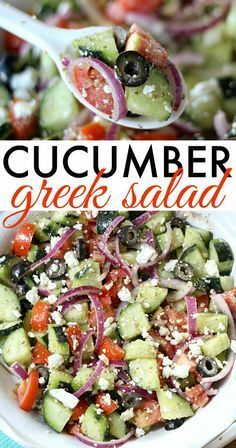 This Cucumber Greek Salad is light and refreshing, and full of healthy ingredients. 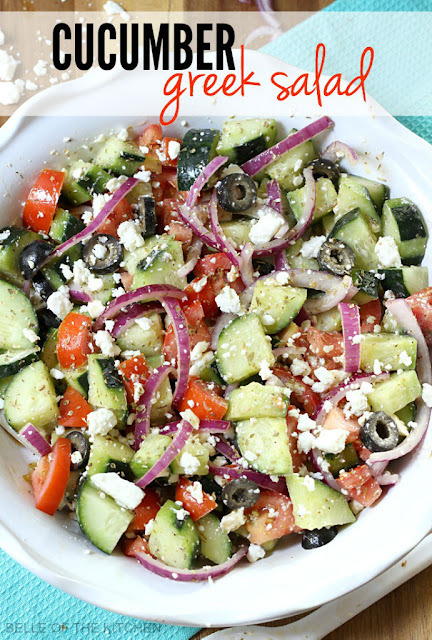 With minimal prep, it makes any easy side dish for any meal! Sprinkle feta cheese and olives over the top of salad and mix. Taste and adjust spices if need be. Refrigerate until ready to eat. Enjoy!